Steven Russell from the Massachusetts Clean cities Coalition and the Massachusetts Department of Energy Resources was in attendance and provided our guests with tremendous amounts of information about the Electric vehicles and the clean energy market. Aaron Myatt from the Trikke Academy was also in attendance offering test rides of regular Trikkes and electric powered Trikkes. You're Invited to Vineyard Power's 2nd Annual Electric Vehicle Car Day! You will have the opportunity to view or test drive an electric vehicle (Nissan Leaf, Smart Car EV), motorcycle (Brammo), or Trikke carving vehicle and learn about how fun, affordable and convenient EVs are to drive and charge. 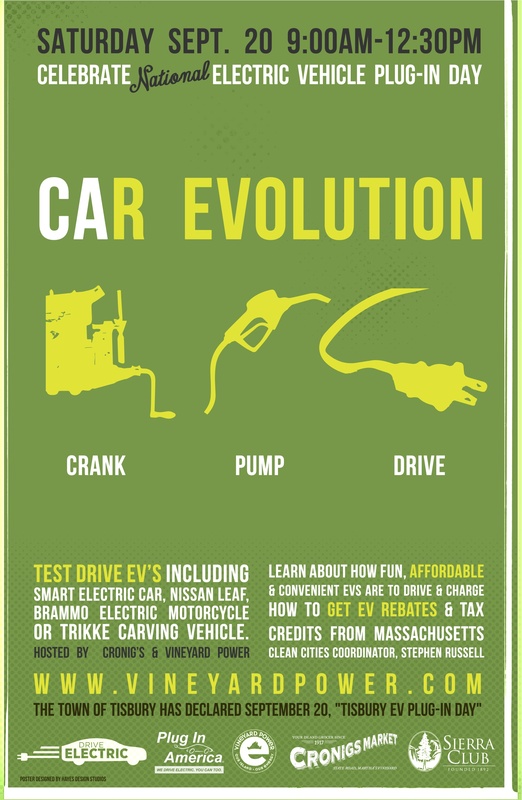 Also, learn how to get EV rebates & tax credits from and from the Massachusetts Clean Cities Coordinator, Stephen Russell! If you have an electric vehicle please feel free to bring it to the event to share your experiences with other owners and attendees!